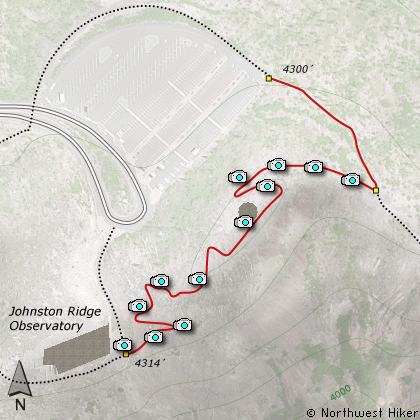 This rather steep universal access trail is a must do walk while visiting the Johnston Ridge Observatory. The trail is kinda steep, but paved and an excellent way to view and learn about the Mt. 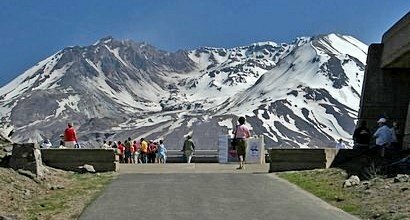 St. Helens phenomena. There are guided walks along this part of the Boundary Trail, which begins at the observatory and heads east to Mt. Adams. Drive south on I-5 to the junction of State Road 504. Exit the freeway, and turn left (east) onto SR504 and follow it east. At five miles you will pass the Silver Lake Visitor Center and in another 38 miles you will come to the junction to SR504 E. Bear right onto SR504 East and follow it another 8 miles to the Johnston Ridge Observatory. Drive north on I-5 to the junction of Washington State Road 504. Exit the freeway, and turn right (east) onto SR504 and follow it east. At five miles you will pass the Silver Lake Visitor Center and in another 38 miles you will come to the junction to SR504 E. Bear right onto SR504 East and follow it another 8 miles to the Johnston Ridge Observatory.